Napoli's will open at 4pm on Labor Day. 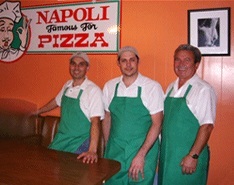 Napoli Pizzeria is Vallejo's local favorite. 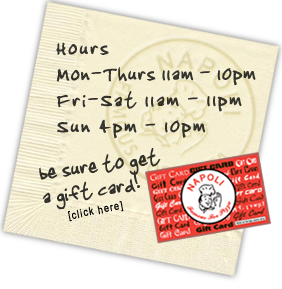 Whether you come from the Vallejo Ferry, live downtown or near the waterfront, Napoli Pizzeria will meet your Italian food cravings. Our menu serves up award-winning, hand-tossed pizzas cooked in well-seasoned brick deck ovens and homemade pasta and sauces. We make great hand-tossed pizza from dough that is made daily in brick ovens. We have many great combinations to choose from such as the Tony's Special, Original, Margherita, Mediterranean, Fresco Verde, and BBQ chicken. We also have gluten-free pizza crust and gluten-free pasta that you can enjoy with our gluten-free marinara, pizza, alfredo, or pesto sauces. 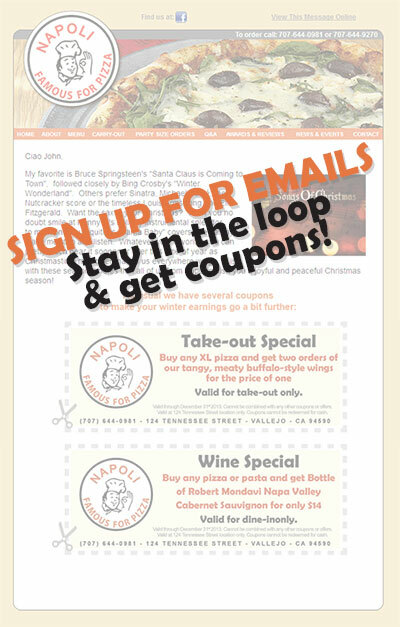 We invite you to give us a try!